The Seto Inland Sea, in Japanese Seto-naikai or Setouchi, has a sea area of 21827 sq km and lies in West Japan between the main islands of Honshu, Shikoku, and Kyushu. It is linked to the Sea of Japan and the Pacific Ocean by narrow channels. 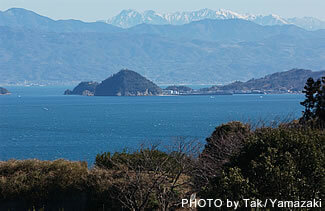 The shallow sea, with an average depth of 38m, is dotted with more than 950 islands, the largest of which is Awaji-shima. The Inland Sea is famed for its scenic beauty and is the site of Inland Sea National Park (660 sq km; established 1934) which includes some 600 islands and coastal segments. Look at the map and imagine sea levels 120m below as they were 10000 years ago - isn't it easy to imagine that the many islands were mountain tops? The area is made up of mountain ranges running North-South, nowadays forming island chains, and large basins, now stretches of open sea. Tide flows come in twice a day from the Eastern and Western end, so for an enclosed sea, water exchange is relatively good. The area has a mild climate with an average temperature of 15 degree C. With 1000-1600mm rain per year, mainly falling in June and September, it is rather dry compared to other areas of Japan. Summer is hot and humid, but winter has many sunny and dry days, ideal for cycling or hiking. The shores of the Inland Sea are heavily populated and are part of Japan's most important industrial belt; many of Japan's greatest ports, including Osaka, Kobe, and Hiroshima are situated here. Urbanisation and industrialization have left their scars. At the end of the 19th century, mountains and islands were deprived of trees, as wood was not only used for daily life but also for salt-production along the coast. Fields and orchards, now restricted to the lower slopes, climbed all the way up the islands, trying to squeeze some food out of the crumbly soil. In the 1960s, even the water was heavily polluted and unrestricted land reclamation ate away at the sea-surface. In 1973, legislation was introduced that led to cleaner water and a slower pace of reclamation. 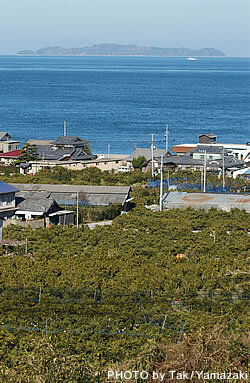 Nowadays, the Inland Sea also has many success stories of environmental restoration. Even one of the traditional landscapes representative of this area, white beaches and green pine trees, is man-made: beaches formed when deforestation led to soil erosion, and pines were planted as fast-growing trees. So don't expect wilderness, but the beauty - and sometimes ugliness - created by human interaction with nature, a cultural landscape grown over the centuries.